Rišňovce (Slovak pronunciation: [ˈɾiʃɲɔʊ̯tsɛ]) is a village and municipality in the Nitra District in western central Slovakia, in the Nitra Region. In historical records the village was first mentioned in 1272. The village lies at an altitude of 161 metres and covers an area of 18.788 km². It has a population of about 1991 people. The population is about 99% Slovak. 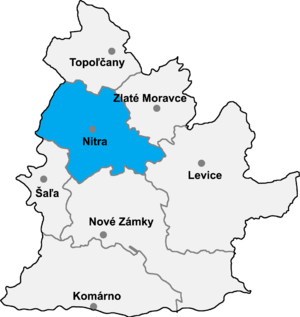 This Nitra Region geography article is a stub. You can help Wikipedia by expanding it. This page was last edited on 29 January 2019, at 14:32 (UTC).